Small hand held GPS receiver with easy to read display. The GARMIN Geko 101 is very easy to use and has an extremely sensitive antenna, which provides navigation information outdoors, in a car, in a train or even in an airplane (see MapSource examples). It's a great device for novice as well as for experienced GPS users. 1) The content of this data field is user configurable. You can select one of the following information: Current speed, heading, trip odometer, trip time, date and time, location (coordinates), elevation, maximum speed, average speed. You may reset the trip-counters and the maximum speed independently of each other. 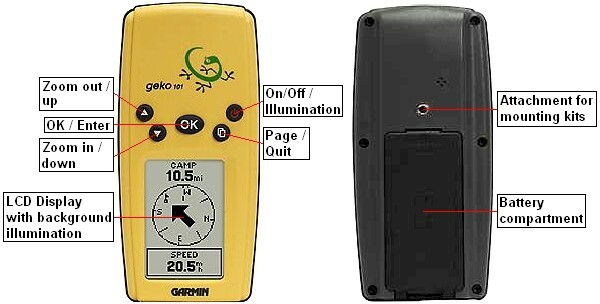 GARMIN Geko 101: This model has been discontinued; however, you can still order options for the Geko 101. All options for the GARMIN Geko 101 in detail. Here we provide additional documentation related to the Geko 101.